Last week ended with yet another HOH cliffhanger, with the remaining houseguests (minus outgoing HOH James) practicing their "perfect shot" on a wavy wooden platform. Practice can go on forever, but the houseguests can roll their red ball one time - and that's the one that counts. The four with the lowest scores become Have Nots which includes Natalie who like 60% figured out a game is happening in this house. Paul is the third person to roll his red ball and gets the perfect 21, knocking out Paulie (who threw the comp) and Victor. While others hit perfect 21 with their practice yellow ball, no one else scores it when it comes. 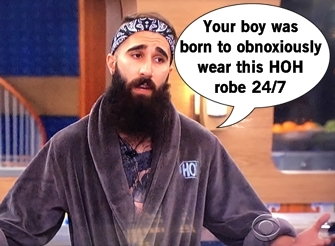 YOUR BOY Paul is now HOH and can use "Friendship" as a verb all week. The first America's Care Package drops into the backyard via parachute as a complete homage/rip-off to The Hunger Games. Natalie is awarded the first prize: a Never Not Pass, which means she never has to be a Have Not again all summer. It's great timing so she can ditch the bumper car bed immediately and get back to spooning James. Not to be a total Natalie, but let's pay attention to the game now. HOH Paul plans to use his power for two things: 1. wear the HOH robe nonstop, and 2. to finish what the house started and send Bridgette home right after her BFF Frank. In order to oust her, Paul wants someone to volunteer as a pawn and SURPRISE! No one wants to be one until a dastardly plan to backdoor Da'vonne comes into play. Paulie agrees to take one for the team because he's such a hero and agrees to sit besides Bridgette on the block and hopefully save himself by winning the veto and have Da'vonne take his spot. The power of FRIENDSHIP! The game is so minuscule in this house since it's dominated by Friendship and showmances. Paulie and Zakiyah have an tiff and the biggest drama to happen is Michelle throws an apple at Paul and gives him a welt. Bridgette is sad she's still an outsider in the house, but HOH Paul pacifies her and tells her she's not the target. I mean, she is the target unless the veto is used and then sure, maybe Da'vonne. Da'vonne is trying anything to keep herself safe and throws Nicole under the bus to The Pauls which only hurts her cause. Paulie wins the Ready, Set, Whoa veto and saves himself, allowing his masterplan to backdoor Da'vonne to come to fruition. The dastardly plan to evict Da' is in motion and she's pretty confused why her friend Paul would nominate her. Paul stresses that Bridgette is the target, and in his heart it's who he'd prefer but the whole house wants Da' out the door. Zakiyah and Michelle, Da's top allies, think she'll be safe but are totally unaware of what is happening in the house. James makes the ultimate blunder in front of Da' by saying in a double eviction situation they's target Bridgette and Victor, which implies Bridgette would survive the next vote. Da' tries to make sure James remains on her side and brings his flirtmance Natalie to force a tie. James is torn between making a game move or a hero move, but ultimately side with making a choice to play the game. Da'vonne is evicted in a 6-2 vote, but she's not surprised since she felt the vibe change in the house. 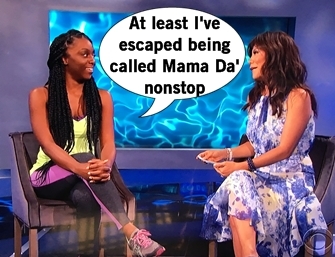 Sadly there's no Round Trip ticket to Da' and instead she heads out to become the first member of the season's jury. 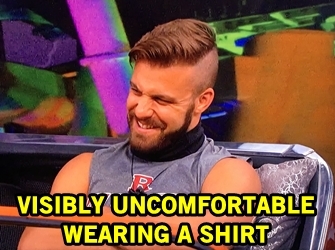 The episode ends with yet another endurance competition cliffhanger to play out on the live feeds. hanging onto ropes as they bump into big hashtags of smacktalk like #USuck and #Grossmance. How about #WorstSeasonEver?